This Saturday, Oct. 17 the 6th annual Wine Tasting at Last National Wine Company will feature a Knife Sharpening Clinic. $3 per blade. Half of the proceeds will go to Eye of the Storm Equine Rescue. The Wine Tasting is from 3pm to 6pm. Address is 18 Powdermill Road (Rt 62) in Acton. For more information, call 978-897-5511. In my high school year book under my picture is a self prediction for my future. I wrote that some day I wanted to rescue horses. Be careful what you wish for. Although we are still active in the rescue business we are currently housing 12 unplaceable horses and two who can be placed only in the perfect homes due to physical, emotional, and behavioral issues. I also have two of my own. There are so many horses no one loves. So many who have no future. There are no words to express my sorrow for them. It’s clear we cannot win this war. All we can do is choose our battle and stick with it. Do what you can with all your means and ability within your circle and do not overly grieve for the ones you cannot save. This how I now live my life. I love my horses. With all the breath in my body and all of what is left of my life force, I will care for these 16 horses until I have nothing left to give. I pray we all die on the same day, or are healed and live forever in paradise because, come war, famine, or plague, only death will take me from them. Amen. Don’t forget us. Your tax deductible donation will help with out educational work as well as with the continued care of our current residents at Eye of the Storm. We so appreciate your past support and beg you to keep us in mind during this season of giving. We can continue this much needed work only with your help. I thank you all again for your immediate emergency response when our stallion, Gabriel, colicked. I am so happy to know we have such a wonderful family as you all. I am so sorry I did not send thank you notes to everyone. There are no addresses from you who donated through PayPal. We love you very much. May you all find peace in the cooler days. I rejoice in the colder days. I rejoice in the lack of bugs, mud, and those horrible summer storms! Though the work is harder in winter, everything is slower and even blizzard conditions don’t carry the horror of tornadoes, hurricanes, and thunderstorms! Our horses seem more content and comfortable. And when they are happy, so the heck am I!! 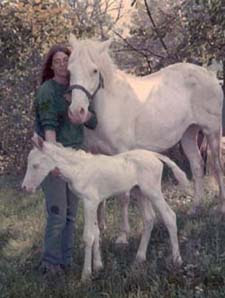 Two days before Jaime died our friend Jo Newcomb lost her 28-year-old pony Buttons. After looking all summer we found a pretty little mini to be her new friend. (See photo.) Jo named her Snowflake because on her totally black body there is a little white snowflake on her back. She is a perfect little lady and is very gentle. So sorry for your loss of dear Buttons, but I believe this little mare will help heal your heart. On May 1, 2009 Jaime died. She was 38 years old. Catherine found her lying on her side with her legs tucked against the wall. She was awake and alert. She tried to get up, but couldn't. With the help of four strong men from Astro Crane Company next door (I so appreciate the strength of men), we managed to pull her away from the wall and roll her onto her other side. That didn't help. She still couldn't get up. I don't believe she had been down for long. Her stall wasn't torn up. All of her feed from the previous night was gone and there was a normal amount of poop. I took her temperature. It was 98.2, which is too low. When the vet arrived we tried again to get her up. By then there were six of us there to help her. After a dose of stimulant (for Jaime, not us, though we all could have used one by then), she thrashed around but still couldn't rise. It was then we collectively decided she was dying and euthanasia was our only option. At this point she was thrashing around between episodes of deep sleep. She was never going to get up again. I held her nose in my hands and said to her, "You are the only horse that has ever beaten me, the only one who never gave in. In all our years together everything between us was a fight. You win, you tough old mare, you win." And so, surrounded by loving friends, including her best friend Mary O., we sent her on her way. She was beautiful and fat and slick. You would never know we was that old. Without a great deal of fuss, her life ended. In the aftermath of so much equine death in my immediate circle I am just not ready to lose Willie. 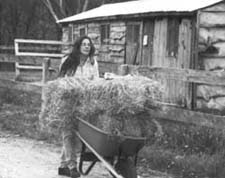 Having been there for three deaths and burials, spending hours on the phone with Laurie from The Vineyard Mini Horse Rescue as one of her ponies, Peppercorn, faded away from some still unidentified abscess infection, my heart needs a rest. The other three were very old, surrounded by beloved friends, and it was just time for them to go. It is amazing how many friends a horse can accumulate in a lifetime, all three were over 30 years old. We had just enough time to say good-bye, and they were gone. Willie was found unconscious six days after Jaime's death. He was down in his stall and we couldn't wake him, though he was still alive. There were five kids from the Dynamy program and three of us Eye of the Storm regulars present. Thanks to an unfinished sling I had made years ago, the eight of us were able to hoist Willie to his feet and attach him to the ceiling. He hung there like a dead spider. The vet was on his way. Thinking he was dying, I brought Junebug, his very best friend, in to say good-bye. And - he woke up! Since that day Willie has never laid down again on his own. After six days he's so exhausted that for some reason he develops muscle spasms in his "bad" hind leg which causes him to spin in a circle. He continually hits his right eye on whatever it is he crashes into. He's also a very picky eater, although he really wants to eat hay and he just can't anymore. No one can accuse us of not trying to help him. We had his head x-rayed so the dentist could float his teeth properly, that is, the few he has left. He's had acupuncture, a chiropractic adjustment, steroids, pain meds daily, and buckets of loving care. He's very thin and looks like a plucked chicken. But Willie wants to live! He's really a horse though he's only 13.2 hands tall. He sparkles like a bright red jewel. He glistens with health and he heals practically overnight. His original name was Diamond Jim, we have recently discovered. He had a catastrophic tendon injury to his left hind leg leaving him, basically, three legged. No one in his past wants to take responsibility for hurting him, of course. But now he's with us for the rest of his life, and we love him. We have become quite adept at plunking him down on a memory foam mattress so he can sleep without getting sores on his poor little bony parts. (See the photo.) After some hours we hoist him to his feet in the sling. In a few minutes he walks off, gets a drink of water, poops, pees, and dives into his food, totally refreshed for another few days. Then we do it all over again. We have changed his feed to Blue Seal Senior, which basically dissolves in his mouth and he's gaining weight. One day recently I found him lying in the mud mashed up against the gate. He must have slipped and fallen. I ran next door and got three big men to come help me drag him through the gate and out of the mud. These awesome guys just roll their eyes when they see me coming and say, "Oh no, what's happened now?" Other than the horrible and constant noise they make, it's quite wonderful to be surrounded by heavy equipment operators, as there is always someone to come running. They all love animals and have different and very good ideas on how to help at such times. I love them all and can't thank them enough. Though we again helped Willie to his feet, he had not rested, as he felt very exposed and afraid out in the open. So two days later we laid him down on his mattress in Faith's "cabana," a 14'x14' screen house with rubber walls, floor deep bedding, and his 4 inch memory foam mattress with fleece blankets to lay on. He still could not relax. He kept trying to get up. Every three minutes Catherine and I would find ourselves standing outside to watch him. Cassie, his stall mate, parked herself just outside. She held vigil, refusing to eat or drink. I said to Catherine, "I feel like he's calling me, I just have to keep coming to him." Catherine said, "Yes, I feel him, too!" As did Cassie, apparently. We didn't want to go in and bother him, we wanted him to sleep. So, after due consideration, we gave him one mg of Xanax. In 15 minutes Willie was sound asleep. Willie has taught me that undisturbed REM sleep is essential for old horses. They need a place to feel safe and comfortable, where no other horse will bully or harass them. They want to know there are others nearby to protect them from predators. Willie sent us all a clear message of "Help me, I can't get up and I'm alone." Catherine and I went in and lay down on the mattress with him. He wanted us there. We held him and petted him. We whispered to him. He slept surrounded by our love. Late that night, after Xanax for both me and Willie, who now rested comfortably with his back against the cabana wall, I also tried to sleep. I could not. My mind would not let things go. I decided that if Willie could not get up on his own, tomorrow would be the last day of his life. I just couldn't do this anymore. I prayed, "Jehovah, you entrusted the care of Willie to me, but both he and I belong to you. Let your will take place in our lives and please let us both get some sleep. In Jesus' name." And we slept. Next morning I found my Willie standing in the midst of chaos. He had eaten most of his grain, drank water, peed, and had just finished pooping on the edge of his mattress on which he as standing! The extra mattresses and blankets were strewn about and mashed into the mess. Evidently he had been up for a while and had been very busy. But he had gotten up alone! I waded through it all and with tears of joy I threw my arms around him and thanked God for this gift! Kissing and kissing his beautiful old silken, shiny pony face, I feel I experience the resurrection of the dead with him over and over again! How can we know when it's time to make the awful decision to euthanize them? Often it's obvious. Jaime was never getting up again. Buttons, Pepper and Bess were not going to make it. Snowdrop was living with endless unmanageable pain with no hope of relief. But, what about Willie? He's a tired old man, exhausted at times, yes, with muscle spasms at times, but he's not suffering. I watch him hobble around with his two friends, Cassie and Junebug, tossing his head like the stud muffin he thinks he is and I know he's happy to be alive. It's frustrating and inconvenient for us on the days we have to lay him down and help him up, but how much longer is he going to live anyway? When life is no longer fun for him, he'll let me know. It will be his decision, not mine. I'm so glad. I don't know why I think that it's up to me anyway. My sweet beautiful jewel, Diamond Jim Willie, kisses for his nose, another day, another gift of his presence. Maybe tomorrow will be his last day, but today is not. There are many ways that you can help the horses at Eye of the Storm. Send a tax-deductible donation. See the instructions on the bottom of the page. Eye of the Storm is a non-profit corporation, registered with the IRS as a 170(b)(1)(a)vi, a non profit organization for the prevention of cruelty to animals, under section 501(c)(3) of the IRS code. Your entire contribution will go to to help the horses. Frequently-asked questions about donations. Visit the advertisers you see in the Google adwords ads appearing on this blog. These ads help provide additional income to buy food and supplies for the horses. Every time someone clicks on one of the ads, Eye of the Storm earns a few cents. So please, feel free to click on them. All the ads are related to horses, so you'll learn about some new products and services while helping Eye of the Storm at the same time. Remember us in your will. If you would like to make a contribution to Eye of the Storm as a provision of your will, please contact us for details so the bequest is done correctly and the money is certain to go to the horses. Volunteer! We need experienced horsemen and horsewomen to help with feeding, watering, turning horses out, and cleaning stalls and paddocks. We especially need responsible local people who can work with a minimum of direction. Call Nina Arbella at (978) 897-8866 or send us an email to find out more! Donate horse stuff -- feed, veterinary supplies, and equipment for the horses to use. And we'd REALLY love to find a new location, at a farm with plenty of pasture and turnout space for 12 - 15 horses. Here's our wishlist. Donate items, such as riding apparel and tack, that we can sell.. Subscribe to this blog and to our Facebook group. Hear about the latest horses we've rescued and all our latest news. There is no such thing as an insignificant donation. Every penny counts! Just click on the button above to make an on-line donation. Be sure to let us know if you would like a gift. animals to have a permanent, safe and loving home. We often get questions about donating to Eye of the Storm Equine Rescue. Through the cooperation of local businesspeople and help from volunteers, we're able to keep expenses as low as possible, but providing for these animals is still costly. Here are a few examples of costs for just one horse . . . Absolutely! We are a 509(a)1 non-profit foundation, and every cent of your donation is tax-deductible. This means that your donations can help YOU to lessen your tax bill. For instance: If you're in the 40% tax bracket and you donate $100 to Eye of the Storm, your federal income tax is lowered by $40, so your donation actually costs you only $60. Can I designate my contribution for a particular horse? Yes. If you'd like to help sponsor a specific horse or pony, we'll send you a photo and profile so you'll know more about that horse's history and special needs. Is there a minimum contribution amount? No! We're delighted to accept donations in any amount. We also appreciate donations of needed services, equine horse-care products and feed. If you've recently lost an equine companion, and would like to donate your left-over (good quality) hay or grain, please give us a call. Check our wish list to see what else we need! 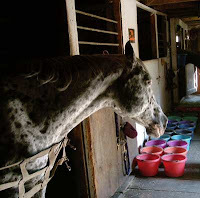 Located in Stow, Massachusetts, Eye of the Storm is an equine rescue center dedicated to saving the lives of horses who have been abused, neglected or abandoned. Horses that come to this barn remain here for life, or may be placed in approved foster homes once they are completely rehabilitated. Eye of the Storm always retains custody of its horses, even when they are placed in foster homes. 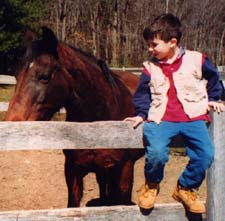 The farm was founded by Nina Arbella, a long-time horse owner who was inspired by Stormy, her first and best equine friend. Nina and a small group of volunteers now devote many hours each day to helping, learning about and caring for several horses rescued from abandonment, abuse or a miserable trip to the slaughterhouse. Eye of the Storm also has many "end of the line," young, unsound horses to whom we provide sanctuary for the rest of their lives. Eye of the Storm received its final IRS determination in 2004 after a 5- year working period. We are very excited that we were designated 170(b)(1)(a)vi, a non profit organization for the prevention of cruelty to animals, under section 501(c)(3) of the IRS code. People have used horses for centuries, for work, war, sport and companionship. We owe our horses a fair and responsible partnership of good care and understanding, because their lives have essentially been given to us. Unfortunately, Eye of the Storm isn't able to house or place all of the abused or neglected horses who need our help. But we can save a few -- and we can also provide information, advice and a network of support for horses and their owners who need to know how to care for horses with special needs. Through our newsletter, Internet resources, referrals and consultations, we hope to improve the lives of many old, neglected or unwanted horses.